The parade of spring wildflowers continues its march across the New Hampshire landscape, with new shapes and colors being presented every day. My all-time favorite show, the Painted Trillium, went on display this week and will be on tour for the next week or two. 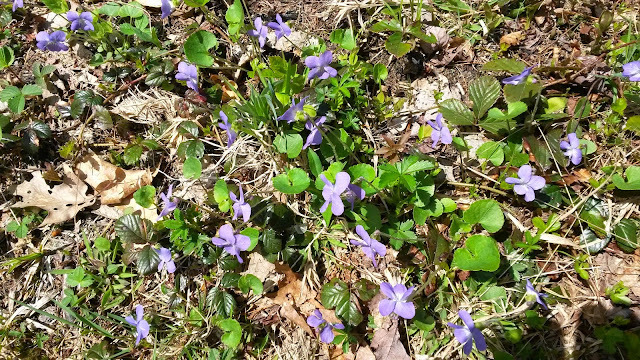 Some of the tiniest flowers are hitting their stride now, some of them blue, some white, and some that can't make up thier minds. One might expect the Bluet to be blue as it name suggests; I find they are more commonly white. Another entrant in the parade is the Goldthread, a miniature white flower on a single, threadlike stalk. And there are both white violets (oxymoron?) and violet violets (redundant?) performing, mostly in sunny, exposed areas. A taller shrub, the Swamp Azalea, has it's white, trumpet blossoms ringing out high above the ground-level performers. This is a new plant that I just discovered right behind our house. These flowers have a touch of red in them, completing the patriotic theme. The spiders have come out to watch the parade; they have the fortunate ability to build their own viewing stands well above the crowds, giving them an excellent birds-eye view of the spectacle. Spiders will construct their webs in the same location every day if they find a productive spot. But if the web gets taken down two or three days in row - as happens when they build a web across a deer trail (or by my face when they build on a hiking trail), they will wisely (and thankfully) move on to a new location. I also was treated to a new bird sighting this week, a woodpecker I've long know the name of but have never seen - the Yellow-bellied Sapsucker. This bird may have been the original maple sap farmer. It drills shallow holes in trees to let the sap flow out, and then collects the sap with its tongue. It will also eat the insects that get stuck in the sap. I have heard the drumming of this bird lately, and will look to see if I can find any of the tell-tale shallow holes drilled into trees with sap running out. These are much different from the large cavities the pileated woodpecker makes in its search for ants. It's yellow belly is clearly evident; this bird is a female, as it doesn't have the red spot under its neck that a male sapsucker has. I have spotted the Osprey several times the past couple of weeks, so it appears it has put Lake Wicwas on its parade route again this year as well.